How are batteries replaced on the SimonsVoss locking cylinder? The batteries (2 button cells CR2450) are located on the inside of the door when the locking cylinders have been properly installed. Except for Comfort locking cylinders, where the electronics with battery are located on the outside due to the design. For this reason, Comfort cylinders should always be installed outdoors with the WP (weatherprotect) option for weather protection. Place the battery wrench Figure 3 behind the knob. There should be a gap of at least 3 mm between the fitting and the knob. If not, the forend screw must be loosened. 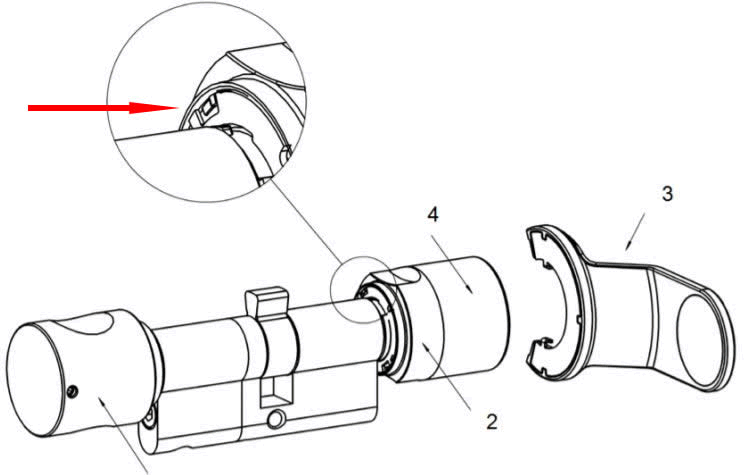 The hooks on the battery wrench should engage in the small recesses behind the knob (see red arrow). Hold the knob and turn the wrench about 30°. Push the lower part of the knob (part 2) towards the door and pull off the upper part of the knob (part 4). Mounting the knob cap is sometimes a bit more difficult. When putting on the cap (part 4) turn it slightly clockwise and simultaneously press part 2 counterclockwise and strongly. You will hear a soft crackling sound when it clicks into place. Then lock again with the battery wrench.